This Is An Affordable Way To Enjoy The Relaxation Of A Hot Tub! Hot tubs are a great way to relax and let the tension of the day melt away along with all those aches and pains. The cost of hot tubs has been a problem for many people who would like to have them. Now an affordable alternative is available. Portable, inflatable hot tubs are much less expensive than the permanently installed, solid hot tub models. Portable hot tubs can be taken with renters as they move. For all these reasons we have decided that providing an overview of Intex 77in PureSpa Portable Bubble Massage Spa Set Reviews will be useful to many people who are yet to make a decision on which model to purchase. Those people that only want to use a hot tub in the warm months can put a portable hot tub away for the winter. With the affordable price and other advantages, it is worth considering an inflatable, portable hot tub such as the Intex 77inch Spa Set. In summary, the Intex pure spa portable hot tub reviews are something of a mixed bag. Many reviews are very positive, and some are very negative. Other reviews are mixed with liking some features and having a few problems with others. The biggest complaints are about the control unit. The replacement units were sent without a problem and worked fine. One customer advised to keep returning control units and getting relacements until a good one was recieved. Other people complained about the customer service department being manned by people who had English as a second language. In general, however, there have been many more positive reviews than negative ones. When people purchase an intex portable inflatable hot tub such as the Intex 77 inch PureSpa Portable Bubble Massage Spa, certain features are included. These features make this a very portable, inflatable hot tub that is easy to use, sturdy, durable, comfortable, and fun for the family. 1. Construction materials. 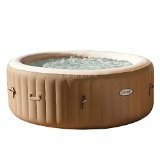 The intex purespa portable inflatable hot tub 77in size is constructed of a fiber tech material that is very sturdy looking and durable. The inside surfaces of the hot tub are made of a 30ply laminated material crafted to be puncture-resistant while providing even support and a high degree of comfort. 2. The hot tub is easy to set up. Setting up this hot tub takes very few tools or time. It does weigh a little over 100 pounds. Set up basically involves taking the hot tub out of the box, inflating it with the inflation hose that is included, and filling it with water. Using a hose takes about three hours. There are easy to follow instructions in the user manual for every step. Once filled with water, the controls are turned on and it takes over night to get up to temperature. Intex 77in PureSpa Portable Bubble Massage Spa Set Reviews agree that set up is easy. 3. Easy to use control panel. The control panel is used to turn on the water heating system and activate the 120 bubble jets that surround the inner walls of the spa. The spa kit includes a heating system, 3-way test strip, 2 filter cartridges and a floating chlorine dispenser. The control panel has codes for problems including the need to change water filters. The control panel is also where the spa owner adjusts the water temperature. 4. There are two filter cartridges included with the hot tub. They are easy to replace and new ones are affordable to purchase. These filters keep the water clean and refreshing. 5. This hot tub has a built in hard water treatment system to soften water and make it more soothing. 6. This spa kit comes with an insulated ground cloth to help it retain heat. It also comes with an inflatable hot tub cover to keep out debris and retain heat. 7. This hot tub is one of the most portable inflatable hot tubs available. There are sturdy handles around the exterior wall of the tub. When the tub is emptied and deflated, it can be stored in the carry bag that is included. 8. The hot tub has a seating capacity of four. It holds 210 gallons of water that it can heat from 68 to 104 degrees Fahrenheit. When fully inflated, this spa measures 57 inches in diameter on the inside and 77 inches on the outside with a height of 28 inches. 9. The cost is usually under $400.00, making it very affordable. Intex has a customer service department to handle any issues covered by the product warranty. 1. These portable, inflatable hot tubs take several hours to heat up the water before they can be used. It can take up to 12 hours, so a little advance planning is needed. 2. When the bubble jets are on, the heating unit may have a hard time keeping the water temperature at 104 degrees in cold weather. 3. Though durable, the inflatable hot tubs are not as sturdy as permanent, solid hot tubs. The lower price goes a long way in making up for this. 4. There is the inconvenience of emptying and deflating these units when they are being moved to another location. Then, when at the new location, they need to be re-inflated and filled.